LG washer getting the LE error code? There may be a few different reasons why the LE error code can display. The LE error code on the LG washers display is mostly an indication of a motor issue. Over-sized clothing loads can strain the motor, a new washer install, too much detergent, and thermal overloads. 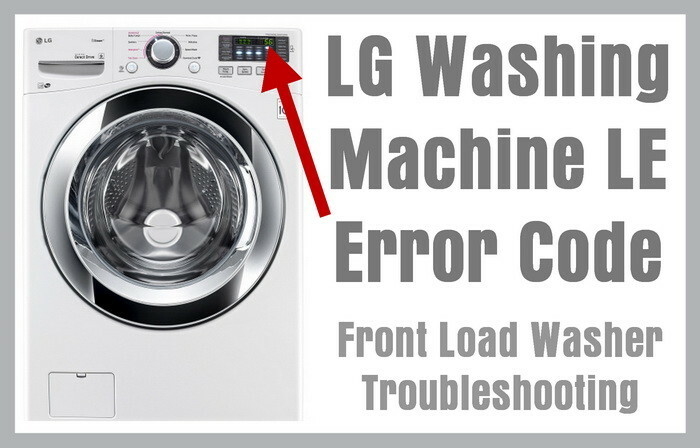 All these issues can cause your LG washer to display the error code LE. With all these different reasons, usually resetting the washer will clear the error and fix your LG washing machine. How do I reset my LG washing machine? Press the POWER button to turn the washer off. Press and hold the START/PAUSE button for 5 to 10 seconds. Plug the washer back in to power or flip the circuit breaker back to ON. The washer should have reset itself and the error code LE is clear. If you were washing an extra large load of clothing, try reducing the size of the load on the next wash and restart the wash cycle. If your washer has been newly installed, the LE error code indicates a miscommunication between the wash motor and the control panel. If this happens, reset the washer by following the steps above. If the washer sees excessive soap suds the LE error code may show. To remove soap suds in the wash drum, simply unplug the washer and let it sit for 1 hour so the soap bubbles dissipate. Once the soap bubbles are gone, plug the washer back into power. If the LE error is still present, perform a reset as explained above. The LE code may show on the washers display because of certain load sizes. The LE code may mean the washer has been overloaded. Extra large wash loads can strain the motor. Take out some of the clothing from the washer and restart the wash cycle. If the LE code shows up again than let the washer sit for 1 hour. This is so the motor can cool down as it has most likely thermally overloaded. If the thermal overload circuit in the motor trips, the LE code may display. The thermal overload in the motor keeps it from overheating. You must let the motor cool down for this LE error code to clear. Let the washer to sit for one hour. Restart the cycle and if the code comes back, try the reset method as shown above. Do you have questions or comments about your LG washing machine getting the LE error code? Please leave a comment below and we will be happy to assist. I have a LE code issue. I reset it twice, but still having an issue. It does not spin. Unsure of what to do next? I have a LG front washer WM2350HWC with an LE code. I have change the motor sensor, still have a LE code. LG said changing the motor ??? But the washing work, it look like drain and spin but the clothes still wet ? I want to be sure that this is a motor problem not the pump? Our LG top load washer, model WT5001C is 5 year old and started having the LE code and UE codes – yes, we’d unplug it, wait and try again and it would proceed, until this week. I set about looking into the issue and lo and behold, found a steel washer and nut under the thing! Lifting the machine, spinning it on and tightening the nut of the impeller shaft fixed it! It makes sense – that the motor couldn’t adequately drive the impeller if it wasn’t connected very well. After the code came on, I replaced the rotor position sensor, filled the washer with clothes and it ran for over an hour without problems. At the end of the cycle, I ran the washer for an extended period of time as the wash that was in there was sitting in the washer for two days until I could get and replace the sensor. I added extra clothes to fill the washer and ran it on the extra hot cycle for two hours. 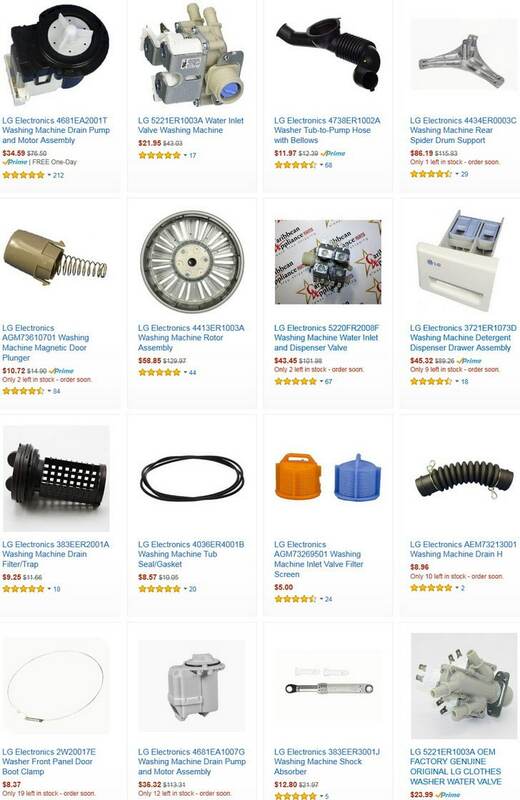 It appears I overheated the motor and I don’t know what to replace next. I need an educated guess as what to do next. I unplugged the machine to reset and let the motor cool, but I’m not sure I fixed the problem in the first place. Next post: Samsung Washing Machine Displays Error Code DC – How To Clear Error?